Piecing Together Paper, Paint & Other Media Like a Puzzle. Geometric & Abstract. Vintage & Modern. Each One-of-a-Kind. It's not uncommon for artists to find their calling and perfect a unique style within the boundaries of the specialty. And yet, you’ll find others who develop their own approach and expand the scope of their chosen technique. A wonderful local example of this is Amber Dalgleish Mustard, a Photographer turned Mixed Media artist. She got her start behind the camera and spent several years in this medium before deciding to explore a variety of other art forms. 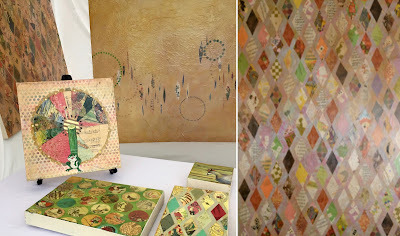 Amber dabbled in drawing and painting as well as paper piecing and collage. What first caught my eye about her artwork was the layers of color, pattern and texture, combining all of these different art forms she's tried her hands at. She is almost like a puzzle master working with photographs, papers, drawings, paints and more. Her compositions are mostly abstract or geometric, coming together through a process of adding and taking away. I very much enjoy her collection using vintage illustrations from children's books. Consider the pieces with diamonds cut from this whimsical paper and then arranged in rows before a painted overlay. It's simple and yet so visually intriguing! Others include slightly more defined subject matter like flowers, stars and circles. Amber uses a common color scheme across her body of work that helps create a coherent collection even though each piece is one-of-a-kind. While I imagine Amber's photography was great, I'm certainly glad she decided to stray and piece together her own version of Mixed Media. Take a look below to peer into the stunning visual style she's developed!